The FORCES OF LIGHT project is an exploration of the esoteric and occult world, with 80's sonority and a return to the glorious italo-dance. The formation of this project stems from a meeting between Leo (keyboardist, music composer, arrangements, mixing), Scorpio (keyboards, vocals, songwriter) and Virgo (singer). Leo and Skorpio, have been working together for several years as founding members of a parallel group, [STARS + CRUSADERS]. When the two met with Virgo, there was an instant spark and Forces of Light was formed. The trio immediately began to work on their debut release, DARKLIGHTS. After about a year in the studio, they emerged with their album, 10 mystical and beautifully crafted tracks. 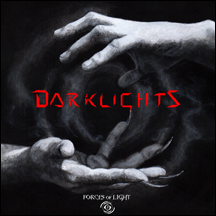 DARKLIGHTS will include FORCES OF LIGHTS first two singles: "TOo Magical" an homage to their magical hometown of Turin and the psycho-sensitive "DIVINER"